Wanted to share this news from Aintitcool.com about a crazy Ultraman-type Japanese movie showing at the Toronto International Film Festival (TIFF) right now. 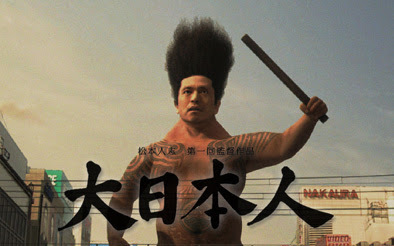 It's called Dai-nipponjin, and it's about a loser guy who turns into a 50-foot giant who looks like a cross between The Rock and Sun Goku (see pic above). When he's a regular sized guy, he actually carries his giant spandex underwear around on his back (see below). 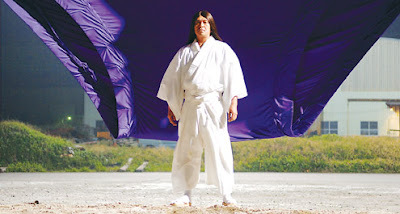 He protects Japan by fighting other giant creatures: one resembles an old guy with a comb-over and giant rubberbands as arms. Yes, it's supposed to be funny. Read more about it here, or go to the Jap site by clicking here or the above pic.